Line shallow baking pan with foil; generously spray foil with cooking spray. In small bowl, mix garlic, cumin and lemon juice. Place chicken in large resealable food-storage plastic bag. Add in lemon juice mixture; shake to evenly coat chicken. Let stand at room temperature 30 minutes to marinate. Heat oven to 350°F. Place chicken in baking pan. If desired, cut 1 of the lemons into 8 wedges and place among chicken in pan for extra moisture and aroma during baking. Cover pan with foil. Bake 1 hour. If baking with skin on the chicken, remove foil after baking 1 hour and broil 2 to 5 minutes or until garlic or top of skin turns golden brown. Meanwhile, cut remaining 2 lemons into 8 slices each. Before serving, sprinkle chicken with parsley. 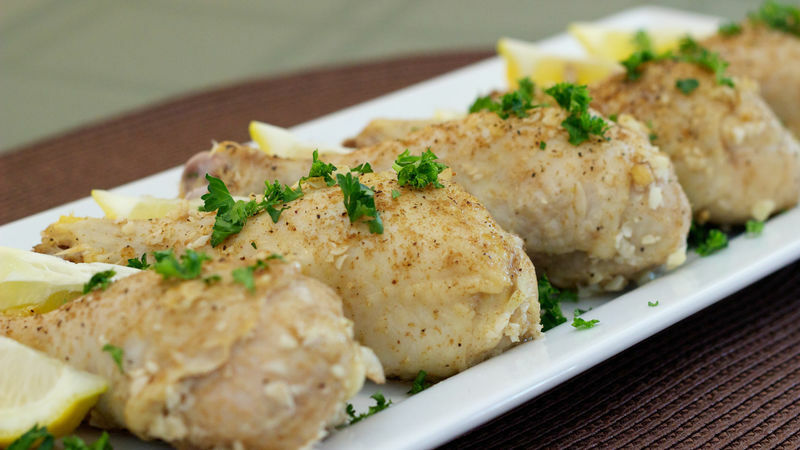 Serve each chicken drumstick with 1 lemon slice. Chicken skin helps keep the chicken moist while baking, but can keep the flavor from soaking into the meat. If desired, remove the chicken skin before marinating and instead, cover chicken pieces individually with a single layer of foil after marinating to lock in the moisture while baking. Sprinkle a little extra cumin (and if desired, salt and pepper) on the top of each chicken piece before baking for a brighter presentation and deeper flavor.